This heavyweight canvas from Masterpiece is the sturdiest cotton canvas on the market. 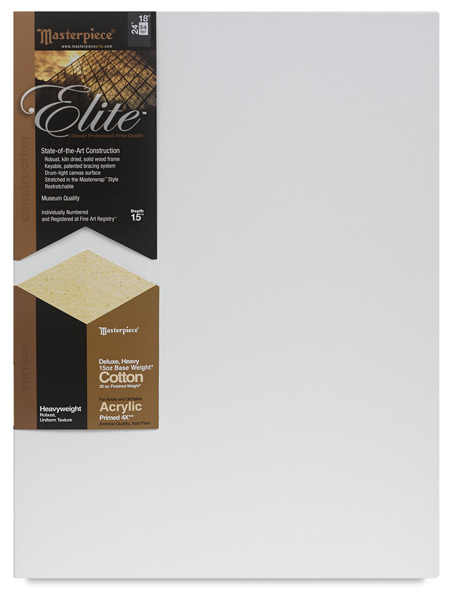 Ideal for heavy paint applications and impasto, Masterpiece Elite Cotton Canvas begins with a durable, 15 oz Shasta canvas that is triple-primed with gesso. Painters can realize maximum luminosity as the brush dances over the Elite surface, which is conservator-approved and archival. Every Elite Cotton Canvas features Masterpiece's best-quality, 1½" profile, B2 solid wood stretcher bars and wide, keyable cross-braces from a renewable Pacific Northwest source. Larger sizes feature custom-sized corner diamond braces. Note — Every canvas is made to order and ships directly from the factory. Due to the unique nature of these canvases, please allow 30 days for delivery and additional shipping charges. Please note that once an order is placed, it cannot be canceled. These made-to-order canvases are also not eligible for returns.